From being something of an oddity rarely seen on our roads, three-wheeled vehicles have truly come of age in recent years. They have become the recreational vehicle of choice for many men and women across Australia and New Zealand. The reasons for their increasing popularity? The feeling of the wind in your hair, the freedom of the highway, the connection between rider and machine, and the fact that they are glorious fun to ride. 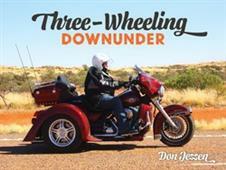 This book features a selection of these vehicles ranging from a 1915 Royal Enfield with cane sidecar to the 2017 Australian Tri Pod three-wheeled sports car and the New Zealand-built James D five-seater V8 trikes. From vintage sidecars to futuristic trikes and three-wheeled cars, these vehicles have a unique ability to capture the imagination.